Wolfgang Kosack "Medis Edwin Smith Papyrus The New York Academy of Medicine." Inv. 217, dipindahkan ke New Hieroglyphics, diterjemahkan dan diedit: Berlin 2011, Christoph Brunner, Basel, 2012, ISBN 978-3-033-03331-3. ^ Wilkins, Robert H. (1992) [Pertama kali terbit pada 1965]. Neurosurgical Classics (edisi ke-2nd). Park Ridge, Illinois: American Association of Neurological Surgeons. ISBN 978-1-879284-09-8. LCCN 2011293270. ^ a b Allen, James P. (2005). The Art of Medicine in Ancient Egypt. New York/New Haven: The Metropolitan Museum of Art/Yale University Press. ISBN 978-0-300-10728-9. LCCN 2005016908. ^ Lewkonia, Ray (2006) [Pertama kali terbit pada 1986]. "education". Dalam Lock, Stephen; Last, John M.; Dunea, George. The Oxford Companion to Medicine (edisi ke-Online). Oxford Reference. doi:10.1093/acref/9780192629500.001.0001. ISBN 978-0-19-172745-0. LCCN 2001021799. ((Perlu berlangganan (help)). ^ Ghalioungui, Paul (1965) [Pertama kali terbit pada 1963]. Magic and Medical Science in Ancient Egypt. New York: Barnes & Noble. LCCN 65029851. ^ Ritner, Robert K. (2005) [Pertama kali terbit pada 2001]. "Medicine". Dalam Redford, Donald B. The Oxford Encyclopedia of Ancient Egypt (edisi ke-Online). Oxford Reference. doi:10.1093/acref/9780195102345.001.0001. ISBN 978-0-19-518765-6. LCCN 99054801. ((Perlu berlangganan (help)). ^ Nunn, John F. (1996). Ancient Egyptian Medicine. Norman, Oklahoma: University of Oklahoma Press. ISBN 978-0-8061-2831-3. LCCN 95039770. Wolfgang Kosack: "Der medizinische Papyrus Edwin Smith." The New York Academy of Medicine, Inv. 217; Neu in Hieroglyphen übertragen, übersetzt und bearbeitet: Berlin 2011; Christoph Brunner, Basel 2012, ISBN 978-3-033-03331-3. Turning the Pages: a virtual reconstruction of the Edwin Smith Papyrus. From the U.S. National Library of Medicine. Ancient Egyptian Alchemy and Science, contains a detailed description of the manuscript. 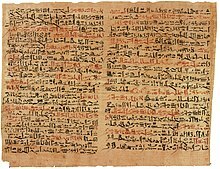 The Edwin Smith Surgical Papyrus: translation of all 48 cases from the papyrus. An unacknowledged reprint of the translations from Breasted 1930. History of Medicine: lists other papyruses. Halaman ini terakhir diubah pada 29 November 2017, pukul 07.51.